Honoraria are tokens that acknowledge the time and contributions donated by research participants. Communities that conduct Point-in-Time Counts offer honoraria to participants, including money, gift cards, granola bars, backpacks, clothing, blankets, and other items detailed in this paper. The Canadian Observatory on Homelessness has previously commented on the use of honoraria in the Point-in-Time Count Toolkit. 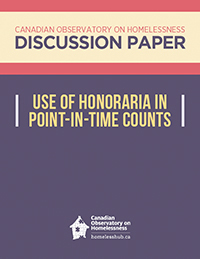 This paper outlines the Canadian Observatory on Homelessness’ position on the use of honoraria during Point-in-Time Counts. Different communities will have varying levels of resources when planning and conducting PiT Counts; we suggest that you use the following as a guide and adapt it to meet your local needs.